A Township is a basic division of a County, a primary unit of local government having powers to levy taxes, pass local ordinances & regulations, and provide various services as authorized by state statutes and elected officials. 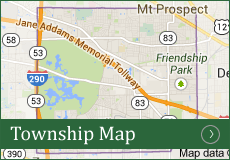 Ideally, a township is a portion of territory 6 miles on each side – 36 miles in area. However, this often varies due to both geographical and political reasons. 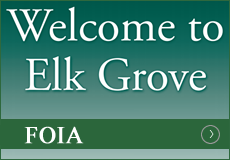 Elk Grove Township is about 31 square miles having lost an area at its southeast corner, now part of O’Hare Field, to the City of Chicago. The boundaries of Elk Grove Township are Central Road on the north; Mount Prospect Road on the east; Devon Avenue on the south; and Rohlwing Road; (generally Route 53) on the west. About 66% of Elk Grove Village is in our Township; 55% of Mount Prospect; 20% of Des Plaines; 15% of Arlington Heights and 10% of Rolling Meadows. About one-fourth of the geographic area of the Township is unincorporated, a large portion of which is forest preserve. There are eight elected Township officials. The Supervisor is the chief administrative official, Chairman of the Board of Trustees, Treasurer of all funds and Supervisor of General Assistance. The Clerk is the secretary of the Board of Trustees, custodian of all Township records and has responsibility in all matters relating to elections. 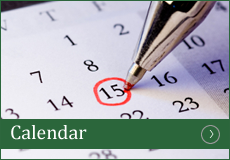 The Assessor is in charge of all matters pertaining to tax assessment, tax complaints, and tax relief grants. The Highway Commissioner is responsible for the construction, maintenance and repairs of all township roads and bridges. Along with the Supervisor the Trustees, four in number, make up the Board of Trustees, which is the legislative branch of the Township. They examine all township accounts, set township policy, determine budgets and tax levies and serve on various township boards and commissions. 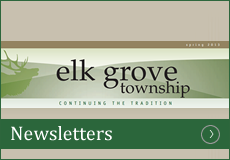 Elk Grove Township has four budgets – Town Fund, General Assistance, Road & Bridge and Sewer. The Board of Trustees passes budgets for each fiscal year, which runs from April 1st to March 31st. The Town Fund Budget covers administrative and operating costs, salaries, supplies, maintenance, renovation and social service programs. It is funded primarily with real estate tax money plus some small amounts of miscellaneous income and investment interest. The General Assistance Budget covers operating expenses and support for the needy that qualify under the general assistance guidelines. It is funded by real estate tax money, contributions from the public and businesses, and investment income. The Road & Bridge Budget covers administrative costs, highway department employee’s salaries and costs to construct, maintain and repair township road’s and bridges. It is funded by real estate tax money and investment interest. The Sewer Budget covers administrative costs, repairs, construction and maintenance of sewers owned by the Township. No tax monies are involved in this budget. All funds are obtained from maintenance fees paid by commercial, industrial and residential users and investment interest. Approximate 1% of a township homeowner’s real estate taxes fund the combined Town Fund, General Assistance and Road and Bridge budgets. The other 99% go to Schools, Cook County, and your local Village/City, Libraries, Park Districts, Water Reclamation, Forest Preserve, Cook County Health Facilities and other governmental entities.